Thales was a well known figure of his time. He was born around 685 BC. He left no writings, and what we know about him comes mainly from Aristotle. 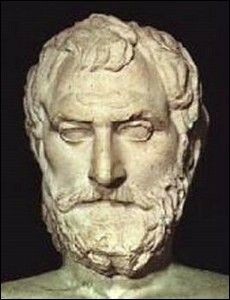 According to Aristotle, Thales believe that water is the origin of all things and the the world floats on water. Thales became wealthy, not by selling water softeners but by using natural evidence to predict olive harvests and investing accordingly in olive oil futures. Other notable accomplishments were measuring the height of the great pyramid by measuring its shadow and discovering magnetism (which he offered as proof that all objects are alive).